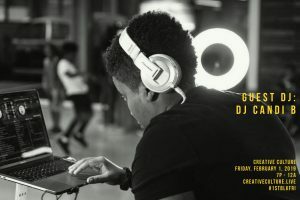 North Brentwood, MD (January 30, 2019) – The Prince George’s African American Museum and Cultural Center (PGAAMCC) is proud to announce the exhibition opening of Soul Illuminance: A Retrospective of Quest Skinner Friday, February, 8, 6-9pm. Join us and experience the dreamscapes, divine feminine representation, alchemy and abstraction that is Quest Skinner’s work. 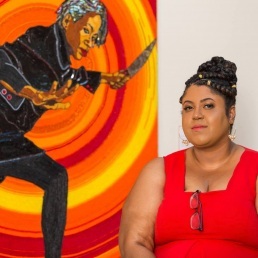 Quest has spent years selling her art at Eastern Market in Downtown DC. She takes pride in selling original art work and her clients always walk away with a one of a kind original, rather than manufactured prints. As a result, every year, she changes her style to reflect one year of experiences, creating 50 to 150 pieces per week, and selling nearly half of what she produced per weekend at Eastern Market. She continues to evolve with her work, and the art in our galleries are an extension of Quest Skinner’s 2018 collection. Quest’s goal is to paint reflections of fierce, fancy, and unapologetic femininity. ‘Men are not our beasts of burden, and we should not treat them as such’. Her depictions seek to challenge the societal norms that suggest that men and women have equal footing in relationships, the workplace, and within their own identities. This idea is manifested with images of warrior women slaying dragons, ballerinas and dancers striking a pose, and intricate body busts of the male and female anatomy. In addition, the dirty pour style creates lush abstract art that can be interpreted and viewed dynamically in a reading of the ink blots. 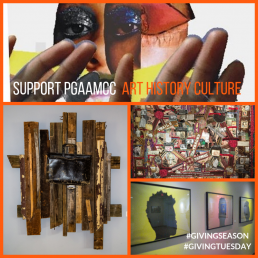 Curated by PGAAMCC Executive Director Monica Montgomery, the exhibition creates conversations between historical and contemporary artists of diverse cultural backgrounds exploring a broad range of themes including the body, identity, materiality, and private versus public selves. 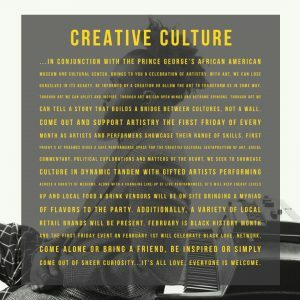 The Prince George’s African American Museum and Cultural Center is recognized nationally and internationally for its innovative approach to the documentation, interpretation, preservation, and presentation of local and regional African American history, art, and culture. PGAAMCC is open Tuesday through Saturday, 10am-5pm. Admission to the museum is free. For more information, call (301) 809-0440, email programs@pgaamcc.org, or visit the Museum’s website at www.pgaamcc.org. Join PGAAMCC for an engaging artist talk with 40 Acres Deferred curator Maleke Glee, featuring artists: Tim Davis, Dr. Joan M.e. Gaither, Lionel Frazier, and Zsudayka Nzinga Terrell. 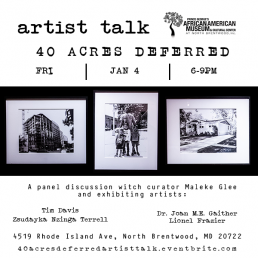 40 Acres Deferred highlights the ways in which, even with oppressive systems actively dismantling the rights outlined in our constitution, Black Americans have created spaces that affirm liberty, justice, and happiness. The presenting artists apply varied mediums and stylization in the interpretation of their individual and collective narratives. These narratives follow in the legacy of African American artists who have explored personal, regional, and national trends within the historical moments that shape American culture. We will be discussing the featured artworks that explore Black American migratory patterns, the process of homemaking, and socio-economic autonomy. The contemporary pieces have embedded remnants of the past in subtle influence, narrative, or stylization. For African Americans, the 40 Acres Promise has been deferred, just as our governmental right to life, liberty, and the pursuit of happiness. 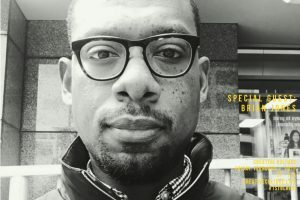 Yet, Black Americans thrive in their spaces; with each passing year, the power of ownership is communicated in the pursuit of legacy building, economic mobility, and cultural preservation. The artists featured in 40 Acres Deferred are paving a new legacy informed by their experience within landscape; their work is derived from the footsteps of their forebears and the environment that has shaped them. 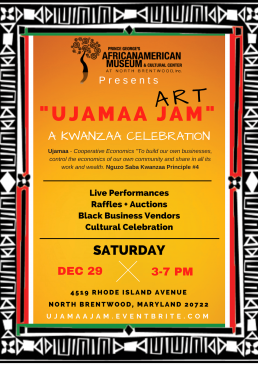 We are so excited to announce our upcoming Kwanzaa Celebration pop-up: Ujamaa Art Jam! 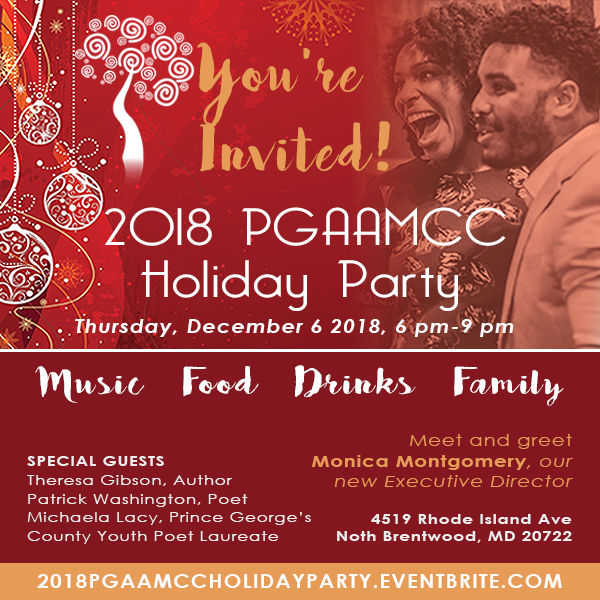 The Prince George's Sentinel highlights the importance of PGAAMCC community impact at the annual 2018 Holiday Party. 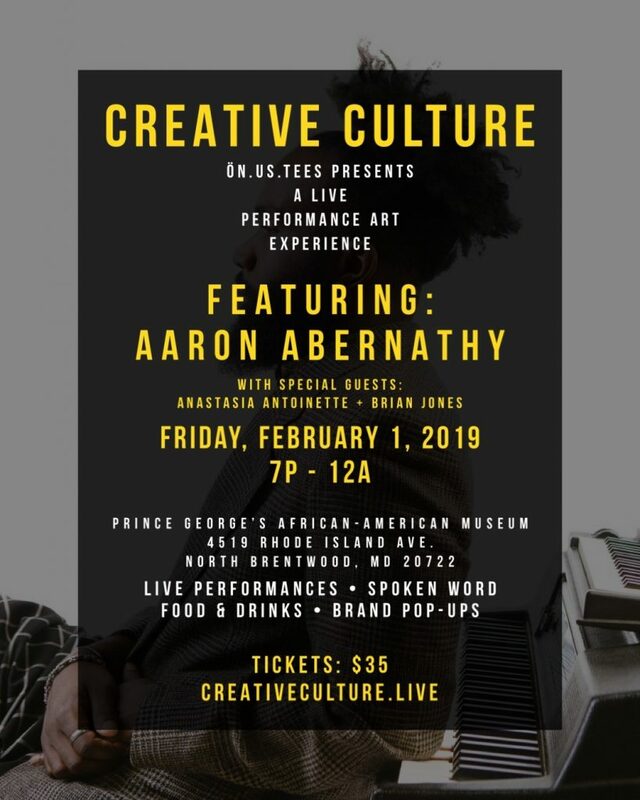 Featuring some very talented artists including poetry performances by Patrick Washington, Prince George's County Youth Poet Laureate Michaela Lacy, vocalist Tamara Jade, and special guest author Theresa Gibson. The story includes quotes from our new Executive Director Mrs. Monica O. Montgomery, who shared the Creative Expansion Plan for 2019. Read full article here. 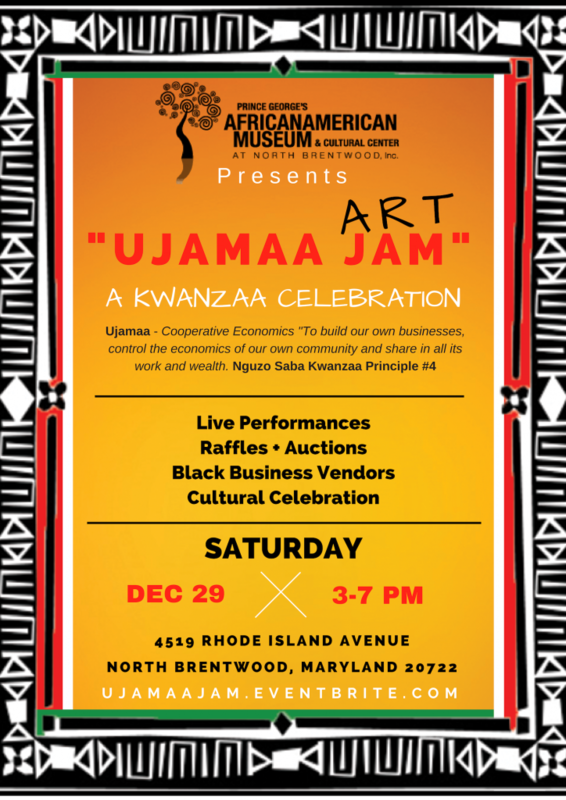 Join Prince George's African American Museum and Cultural Center for a Holiday Party to celebrate the season! 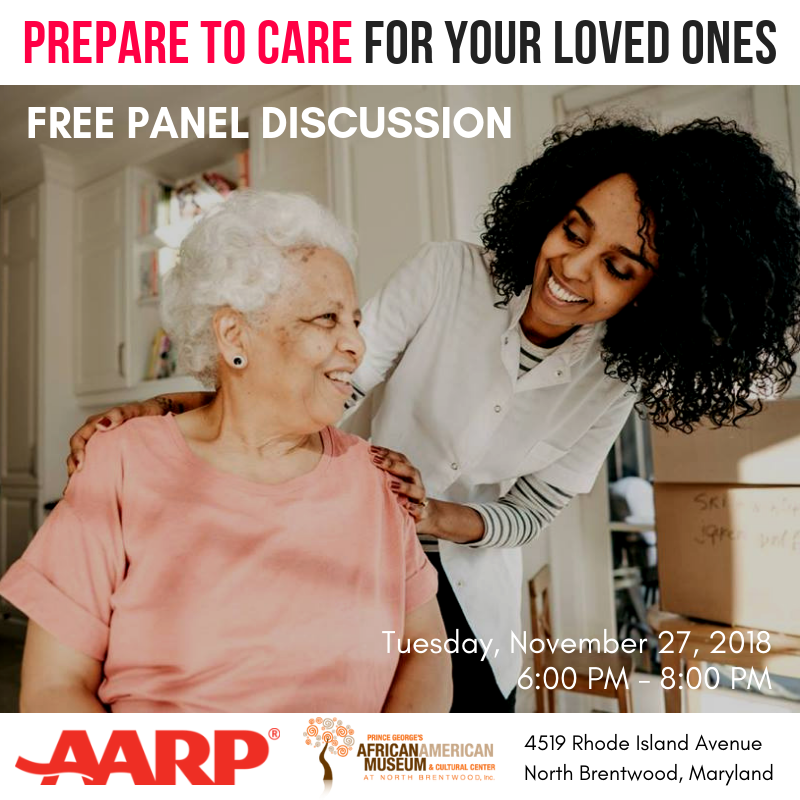 Join AARP MD as we partner with the Prince George’s African American Museum and Cultural Center for an important discussion around family caregiving. This interactive panel discussion will feature experts from various agencies and organizations that will answer questions, offer information on resources, and share details about services available to those preparing or currently caring for loved ones. This is a free event with free parking. Refreshments will be provided. Monica O. Montgomery, is the new Executive Director of Prince Georges African American Museum and Cultural Center. She is an arts and culture innovator using creativity and narrative as a means of bridging the gap between people and movements. As an independent curator, museum consultant and keynote speaker, she uses her platforms to be in service to society. 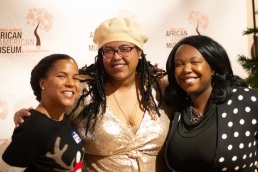 She is co-founder and strategic director of Museum Hue a multicultural platform advancing diversity, equity & inclusion initiatives for people of color, in arts, culture, museums and creative economy. She works internationally to facilitate diversity, equity & inclusion initiatives with clients throughout Europe, Africa and North America. As a museum activist, Monica advocates globally for social justice and relevance embedded in museum practice. She is a dynamic force for change, recently delivering a TedX talk entitled ‘How To Be an Upstander’ challenging everyone to stand up, speak up and act up for social good. She holds a Bachelors of Arts in Broadcast Communication from Temple University and a Masters of Arts in Corporate Communication from LaSalle University. 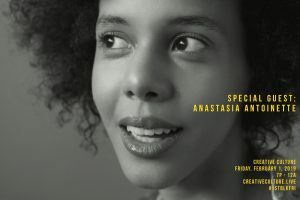 She is an adjunct professor who’s taught in Museum Studies graduate programs at Harvard University, Pratt Institute, and NYU and guest lectured at Princeton University, Columbia University, American University, Johns Hopkins University, University of Pennsylvania, CUNY, University of the Arts and dozens more. Monica holds leadership advisory positions in OfByFor All Change Network, NYC Arts in Education Roundtable, Leading Changemakers, Arts Marketing Association UK, Museums As Sites of Social Action and other groups.